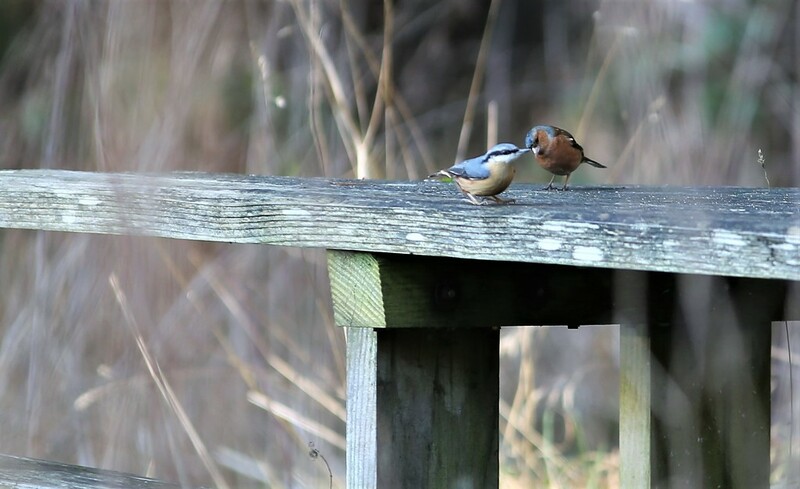 Taken yesterday at Willingham Woods; at first the Robin had landed on the picnic table to be joined by the Chaffinch, when a Nuthatch came in also. The Robin flew away but the Chaffinch remained. Other than at a whole load of bird-feeders at Fountains Abbey in Yorkshire, I have never seen a Nuthatch in the wild before. And there was me the other week saying to Carole and as woods go, Willingham Woods are boring. Sweet photo. It looks like they are having a nice visit. Talk about right time right place! What a superb picture. A friendly chat over the fence, just like all good neighbors do. Lovely shot, I missed this totally! But you know What I’m like! oh this is truly beuatiful! Well caught Phil. An unusual combination. Really pretty birds. Great capture. What a treat to see the nuthatch. I have only rarely seen them in the wild too.